If you’re looking for ways to improve virtually any process in your facility, you will want to make sure you are making informed changes that are focused on getting the results you desire. One of the best ways to determine what type of changes to which processes should be made is to use the DMAIC cycle. The DMAIC cycle is a data-driven improvement cycle that can help to make much more informed and effective decisions regarding process improvements. DMAIC is an acronym that stands for Define, Measure, Analyze, Improve and Control. Each of these steps can be used in a continuous cycle to not only come up with great process improvements, but to help create an ongoing environment of improvement. 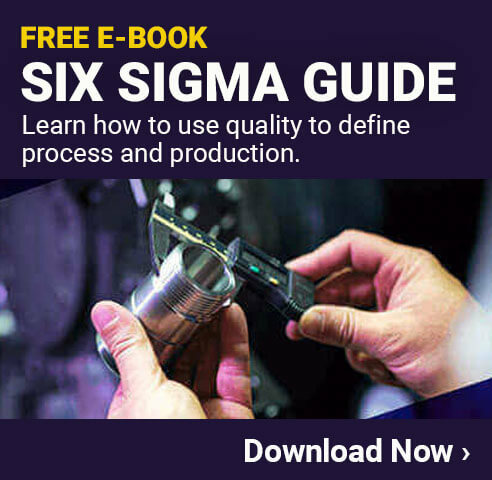 Learning about the different stages in the DMAIC cycle will help you to plan and develop just about all types of processes in your facility. This is one of the reasons that the DMAIC cycle has become a key component for Six Sigma and Lean focused companies. What are the DMAIC Steps? The first step is to define the specific goals of the activity that will be performed. It is important to be as detailed as possible here, since you don’t want to be making changes just for the sake of change. Setting clear goals will not only give you a clear objective, but will also give you a clear way to measure success after the change has been implemented. The second step is to measure the system as it currently stands. This will give you a baseline measurement that you will be able to compare the data with after the changes are made. Gathering as much information as possible about the current system will help to ensure any changes will be focused on areas with the most potential improvement. In the third step you will be looking at the current system, including the information gathered in the previous step, to see what types of performance improvements the change will provide. While looking at the data, you can work on estimating how much of an improvement can be expected. This is very beneficial in helping to see whether or not a particular change is a good decision or not. The fourth step is where you come up with the actual improvement steps that you are looking to try. Finding new or innovative ways of completing processes and tasks in better, smarter, faster or cheaper ways. At this step you should be considering all different improvement opportunities and weighing out the benefits of each. Once an improvement task has been identified, you’ll want to control the new system to help give it the best chance at success possible. There are many different steps that you can include in working on this part of the DMAIC Cycle. Things like offering proper training to everyone who will be impacted by the change and providing proper compensation or incentives to the employees are a great start. When necessary, you should also include budgeting in the money that will be necessary to make this change a success. This step also deals with how the new process will be managed, so any changes in this area should be considered as well. Once you’ve gone through the entire DMAIC Cycle, you can implement the changes that you have determined to be the best for your goals. Taking the time to make these changes properly will help to ensure you get the results that you were hoping for. Since you should have all the necessary information concerning how the changes will be made from going through the DMAIC steps, it shouldn’t be too difficult to complete. Of course, you want to make sure you are monitoring the adjustments throughout to ensure everything is going as planned. Once you’ve made the changes that you came up with during the initial DMAIC Cycle, you should allow them to run for a while to ensure everyone is used to the updated processes. Once everything is running smoothly, however, you can cycle through the DMAIC process again to learn about how the change worked. While going through the cycle, you can identify areas where further improvements can be made. In most cases, you can continue to refine processes and procedures in an attempt to make sure everything is running as smoothly as possible. Procedure Improvements – Coming up with new and better ways of getting day to day tasks done by implementing procedure improvements can be very helpful. Maintenance Improvements – In many cases maintenance tasks can cause significant downtime and other delays. Finding ways to minimize the impact while maximizing the results can be very helpful. Safety Improvements – It is always a good idea to focus on improving safety in a facility. The DMAIC Cycle can be used for safety improvements quite well. Inventory Improvements – Improving the way your facility manages inventory can yield excellent results. When is it good enough? One thing to keep in mind when using the DMAIC Cycle is that things will never run at 100% efficiency. You could continuously go through the cycle over and over again, and always find improvement opportunities. The important thing is to determine whether or not the improvements being made will be worth the effort. Some facilities get so focused on efficiency that they fail to realize that the changes they are making are taking more time, effort and resources than they are saving in the long run. This is why you really need to focus on seeing whether or not a proposed change makes sense. This can be done in the measure and/or analyze steps. If, for example, an improvement idea is proposed that is expected to save the facility $1000 per month, it might seem like a good idea. If, however, that change will cost $500,000 to implement, it likely won’t pay for itself in enough time to make it worth it. Really taking the time to weigh the costs and benefits while going through the DMAIC Cycle will help to avoid these types of wasteful changes. Another area where you have to be careful is in determining where the benefit will be. Some changes will provide real positive results, in time management, for example, but if they don’t have a positive impact on the company’s bottom line, it may not be a smart change. No matter what types of changes you are making, just make sure you are always working toward the best results for the company as a whole. This will help you to get the most benefit from the DMAIC Cycle.